North Kitsap added a new scoreboard at the North Kitsap Community Pool. We received this picture after it was put up over the weekend. 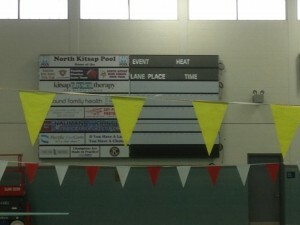 New scoreboard put up at the pool over the weekend. According to a study by the Counsilman Center in Indiana, there may have been a current in the pool that could have affected the outcome of the recent FINA World Championships in Barcelona. Interesting considering Bremerton’s Nathan Adrian finished fourth in the 50 free. These are the type of stories that just baffle me to no end. It is 100 percent illogical. There is nothing to gain hear other than to give the International Paralympic Committee a black eye — and one that is now well deserved, I’d say. Victoria Arlen, an American disabled swimmer, was banned from competing in the IPC World Championships on the eve of the meet Monday. You can read the full story, including what the IPC had to say, here. If you’re a fan of swimming, i.e. the U.S. Men’s Olympic team, and are active on social media then there’s no doubt you know about EveandCandace. You can find them on Twitter @EveandCandace, and YouTube. The pair are die-hard swim fans and trace their admiration and adoration to Bremerton’s Nathan Adrian to pre-Olympic gold in London. The New Yorkers aren’t just in it to gain autographs and pictures of their favorite swimmers. They have a heart. Eve and Candace are holding a raffle, known as the Collective Boyfriend Prize Pack, where all proceeds will go toward the Right to Play organization. According to their website, RTP uses sport and play to educate and empower children and youth to overcome the effects of poverty, conflict, and disease in disadvantaged communities. Nathan is an athlete ambassador. The raffle includes a signed 8×10 photo still of Nathan from The Opaque shoot; a signed 8×10 photo still of Nathan (outtake) from the “Tarp Race” Speedo photo shoot; signed white Speedo swim cap from Nathan’s personal stash; 2014 Speedo Performance catalog that features Nathan and other Speedo cthletes including Ryan Lochte, Cullen Jones and Jessica Hardy and two Speedo noisemakers from 2013 Nationals. There are also three runner-up prizes. The raffle is open until Aug. 30. A couple of days ago I shared the story of Jim Dreyer, who was going to swim across Lake St. Clair to Detroit while hauling 2,000 pounds of bricks. He made it, but it took Dreyer almost 51 hours to complete his quest all in the name of charity. DETROIT — Nearly 51 hours after jumping into a lake near the Michigan-Canada border, a long-distance swimmer who calls himself “The Shark” finished his 22-mile journey to Detroit while hauling hundreds of pounds of bricks. Jim Dreyer had been pulling two dinghies bearing 334 bricks weighing more than 2,000 pounds behind him when he departed Monday for the swim across Lake St. Clair. But by Wednesday morning, after moving more slowly than expected, he was only hauling one during the swim’s final stretch. Dreyer’s swim near the Michigan-Canada border was to raise money for Habitat for Humanity, but he said it had other symbolic meaning given the situation in Detroit, which has filed for bankruptcy protection. “What I really wanted to show is that even though there’s a lot of financial pain in the state of Michigan — and nobody’s felt more pain than the city of Detroit — we don’t have to sink with the weight of our burdens,” he said. Dreyer ended his swim at Detroit’s Belle Isle, located on the Detroit River across from Canada. He had expected to finish Tuesday after about 30 hours, but he said waves along the way — 2-3 feet during the day and 3-4 feet at night — slowed him down. “When you’re pulling a ton of bricks into the whitecaps that’s a big wave,” Dreyer said. Besides the brick-filled dinghies, Dreyer hauled a small lead raft loaded with water, Gatorade, nutritional drinks and a crumbled cracker mixture for food. Dreyer has made direct crossings of the five Great Lakes. He said coping with sleep deprivation has become a regular feature of his ultra-distance swims. His supporters took a boat out to check on his progress early Wednesday and to make sure he was OK.
Dreyer said he had a number of hallucinations, including one at night that he described as a vision of Jesus. Dreyer, whose birthday falls next week, downplayed the role of age in his adventures. The Lake Washington School District board had a tough choice to make Monday. The board unanimously passed bond issues to upgrade/revamp current schools in its district. With the passing of the $755 million measure, the district felt restricted in adding more money to fix the Juanita pool. That decision could mean the closure of the pool, the only public pool in Kirkland. Here’s the full story from the Kirkland Reporter.